Welcome to the Nordic Heritage Center newsletter! This message is the first of its kind from our venue. 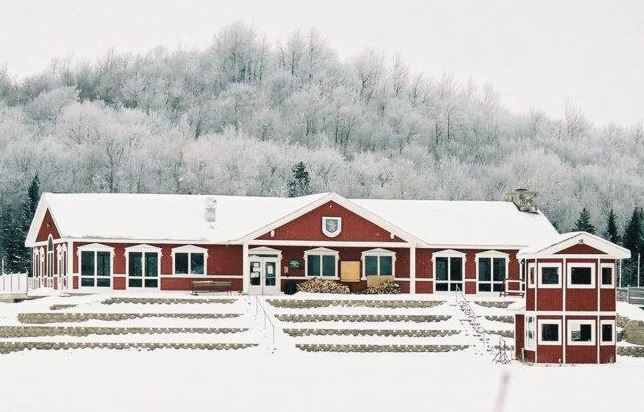 Although the newsletter may be seasonal, it is a gateway, and your connection, to the Nordic Heritage Center in Presque Isle, Maine. In it you’ll find the latest news about our events and program- ming, ways to enjoy our venue and links to how you can be involved with the NHC. This newsletter is only one of the perks of becoming a member of our fantastic outdoor recreation facility, so let us deliver our news to you while you plan your next outing to the NHC. We hope you enjoy hearing from us and spread the word about being a member of the Nordic Heritage Center. The NHC welcomes all members of the public who wish to experience the outdoors. Visit our venue at 450 Fort Fairfield Road, Presque Isle -- just past the Presque Isle Country Club. Grab a bike, some skis or a friend and make time for the Nordic Heritage Center. With 2016 fast approaching, it’s time for Aroostook County to prepare for the World Cup Biathlon this winter. An event that that takes place every two years, the IBU World Cup Biathlon attracts athletes and spectators alike to the Nordic Heritage Center. Many people from the state of Maine and even other countries come together to enjoy the thrill of competition. During the last World Cup Biathlon, it was estimated that 60 million Europeans watched the event at home. This year’s biathlon plans to continue this trend of viewership. Due to the expanding media coverage of the World Cup, it’s no surprise that the revenue of the event is a great asset to the Nordic Heritage Center. The popularity of the sport in Europe and elsewhere attracts many sponsors from across the world and our own backyard, including MMG, Pineland Farms and TAMC. These sponsors make it possible for the Nordic Heritage Center to run an all-year-round and state-of-the-art facility. “Becoming a sponsor for the World Cup is a very easy process and helps immensely in keeping the Nordic Heritage Center running,” Dr. Jacqui Lowman, one of the steering committee members for the Nordic Heritage Sport Club, says. Lowman is a coordinator for local sponsorships that contribute funds to the World Cup. “The biathlon relies much on local sponsorship,” she adds. “All donations from our sponsors go directly to the Nordic Heritage Center—to maintaining it and helping to keep it a great world class facility whose main purpose is as a community venue.” All those interested in becoming a sponsor should contact Lowman or event director, Jane Towle. Many of the participants in the biathlon come from all parts of the globe including Sweden and Russia. Not only does the biathlon provide a venue for people to support their home competitors, it allows the visitors to experience cultures they would normally not encounter. Local school children are given the opportunity to learn about the different countries represented in the competition, all the while cheering on “their” athletes! “This is a perfect opportunity for local school children to learn about cultures other than their own,” Lowman says. “Children are able to attend the opening and closing ceremonies of the World Cup, among other things, and really get to know these athletes. It’s a unique experience.” In essence, the biathlon allows people of all walks of life to come together, whether they are competitors or visitors. Although the IBU World Cup Biathlon may still be a short time away, it is never too early to sign up as a volunteer. Being a volunteer is a great way to learn how to work as a community as well as about other cultures. If interested in volunteering for the biathlon, just access biathlonmaine.com and fill out the online sign-up sheet. After completing, a member of the committee will contact you. Hope to see you there! Here at the Nordic Heritage Center we are looking for fun, hard-working individuals just like you! Get involved and become a part of the team that helps to keep our center running. Explore how simple and rewarding volunteering for the Nordic Heritage Center can be here. The Nordic Heritage Center is always in need of volunteers. In order to keep our facilities open, we are always looking for enthusiastic individuals to lend a hand so that we can keep our center in its best condition. The easiest way to get involved is to stop by a committee meeting. There are lots of friendly faces who would be happy to match you with work that suits your talents and interests. Whether it be clearing trails on a beautiful fall day, organizing or helping at an event for the community, or just getting the word out, everything helps. Whether you’re ready to take on a little, like spending an afternoon doing some care taking, or a lot, like becoming a committee member, we welcome you. Volunteering for the Nordic Heritage Center is a rewarding experience. Give just a little bit of your time and talent and you will receive the unique and gratifying opportunity to improve your community and have a great time doing it. You will be contributing to the preservation of a priceless venue here in Aroostook County. As the saying goes, many hands make for light work! Any contribution you make here is greatly appreciated. Visit our website or contact Tom Chasse for more information and volunteer opportunities. Don’t forget: the IBU World Cup Biathlon is still seeking volunteers. Sign up here. The Nordic Heritage Sport Club has hosted the Nordic Trail Festival annually since 2008. People of all ages are welcome to experience exciting races, games, live music and food. It’s a platform for all enthusiasts who love outside activities to compete and have fun with their family and friends on the first weekend of August. Each year there are more than 100 registered participants. The festival has a series of competitions. The downhill race enables youths and adults to try courses that are designed with a mix of wooded single track and open flowy lines with rollers, berms and man-made jumps on two different courses located at Quoggy Jo Ski Area. Another event, called “biathlon,” allows you to try either running or mountain biking combined with rifle marksmanship. A huge crowd favorite, the “youth races,” enables riders and runners who are under 14 years old to run and mountain bike age appropriate courses. To ensure safety, younger children who are under 7 years old race in the stadium. Older children have the chance to try the word-class courses. If those events don’t match your needs, you could challenge the six-hour bike or trail running race. Chad McPherson has been involved with the festival since it began, fulfilling different roles throughout this time. His most recent role was as chief of competition. McPherson has also competed in the downhill race and mountain bike races. Last year he participated in the six-hour race with a teammate. “I prefer the mountain bike (part of the competition) because I mountain bike all the time for fun. Mountain biking keeps me healthy and it gives me time and space to be away from work and stresses,” McPherson said. His thoughts resonate with many of the other competitors. Volunteers are very important to the success of the event. If you’re interested in being a volunteer, you can send an email to sign up and then you will be asked how you want to help out. The Nordic Trail Festival volunteer opportunities are diverse and range from making sure racers take the right turn to leadership roles on the Organizing Committee. Camping and live music are also parts of the Trail Festival. There are campsites near the parking lot, where campers have access to bathrooms and can use the locker rooms and showers in the main lodge. Talented musicians come to the festival and provide great musical entertainment. So come and join the Nordic Trail Festival. You’ll be glad you did! The Himie Towle Memorial Winter Frolic is an event hosted by the Nordic Heritage Center every year since 2000 to honor the memory of Himie Towle. The winter frolic is an attempt to get families skiing and having fun. There are a lot of competitions in the winter season, but the winter frolic is a family winter outing. Himie Towle used to organize similar types of events in Fort Fairfield for years and years. After Himie Towle died, people found that it was a great way to honor him by continuing to do what he did. Registration is $5 for youth, $10 for adults and $20 for a family. The people who attend the events will get a full-service meal and a fun time with friends and family. The Himie Towle Memorial Winter Frolic has continued for 15 years. And it is still a frolic for family skiing and having fun. We hope to see you at our next Himie Towle Winter Frolic in March 2016. 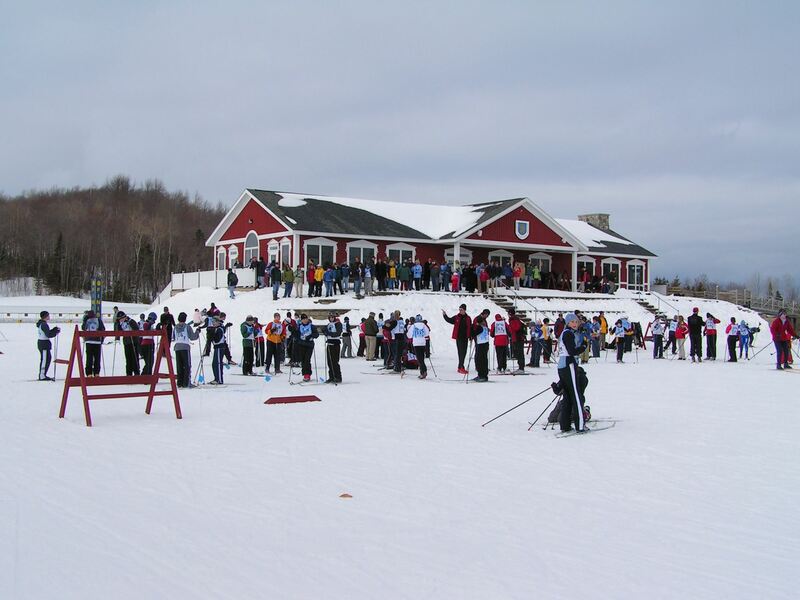 The Nordic Heritage Center also hosts Middle School Ski Races. They usually start after the high school season gets done, which would be the last week of February through the month of March. Schools generally organize the competition. The U.S. 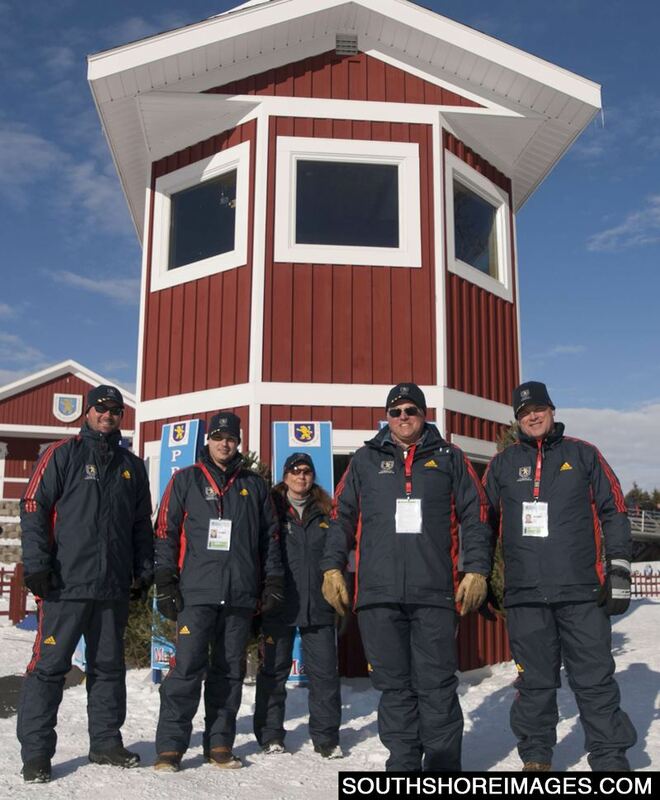 Ski Orienteering Championships will take place at the Nordic Heritage Center, for the first time, March 11-13, 2016. Ski Orienteering is an endurance winter sport. Participants need to challenge navigation and cross-country skiing in this competition. Besides experiencing fast skiing in narrow tracks, it also is a good chance to challenge your short-term memory, mathematical and spatial ability. We welcome you to see skiers face the extreme mental and physical challenge. These are all great chances to go out and have fun at the Nordic Heritage Center during the winter season. Get involved and have fun during the winter. This program is made possible by our very generous sponsor: The Aroostook Medical Center. For without their support we cannot provide the public with this wonderful program. All kids from kindergarten through eighth grade are welcome to join the Nordic Heritage Center Saturday mornings from 10 to 11:30 a.m. to have some fun on skis, and then warm up in the lodge with a healthy snack and hot chocolate. The Youth Ski Program is made possible by generous donations from NHSC members and The Aroostook Medical Center and is free to all. High school students are asked to assist as volunteers. Canadians are welcome! And Free kids rental ski packages for opening week of YSP, 50% YSP discount for remaining weeks of the program. Take part in the NHC’s latest program BEYOND LIMITS: Awaken Your Potential. The nonprofit organization helps people identify and work through their challenges—whether physical or inner. They do this through advocacy, through recreation and other activities, through education and through workshops and training tools for individuals, organizations and businesses. 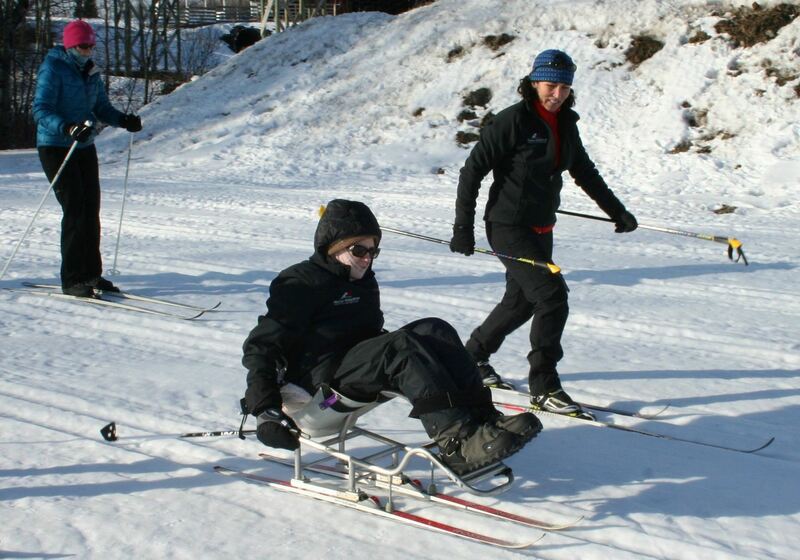 The program provides nurturing, stimulating, gently challenging Nordic skiing and snowshoeing to people with physical, cognitive, emotional, and other inner challenges. The training, use of equipment and warm clothing are all provided free. The fun, liberation, empowerment and feelings of success this engenders are all priceless. It’s really not about recreation but about people trying something they thought was out of reach—and being able to grasp it—while stretching, growing and doing amazing things. Winter Programming will be Saturday mornings, 9 a.m.—12:30 p.m. Participants will arrive by 9 a.m. They’ll work with volunteers to set their goals for the day and get into their outdoor clothing and gear. Then they’ll have a two-hour lesson (adjustments will be made depending on conditions and needs of the participants and the weather). After the lesson, participants and volunteers will shed their gear and all will gather in the main lodge for camaraderie and a hot snack. Come out to the Nordic Heritage Center in Presque Isle, Maine, and go BEYOND your LIMITS. Just give us a try: you have nothing to lose and everything to gain. Participants are required to fill out a few simple forms (Participant Application, Doctor Statement, Release and Waiver of Liability), submit them, and we’ll get you scheduled for some wonderful experiences. For more information contact BEYOND LIMITS founder Dr. Jacqui Lowman drjacqui@beyondlimitsawaken.org. Donations can be made by visiting BeyondLimitsAwaken.org. The Nordic Heritage Center in Presque Isle encourages the public to grab a mountain bike and come out to the NHC for a ride. Bring your friends and join the NHC’s group mountain bike program. The group meets at 6 p.m. every Monday at the NHC Welcome Center and Wednesday at Tom’s Trail trailhead at the facility entrance – weather permitting. Don’t forget to bring a light for your bike so you can find your way on the trails! Don’t have a mountain bike? No worries, we have a small fleet of bikes on hand, but sizes are limited. For more information contact Chad McPherson: 461-1658, trailetr@gmail.com, or Tom Chasse: 551-8956, tomsharo@yahoo.com. 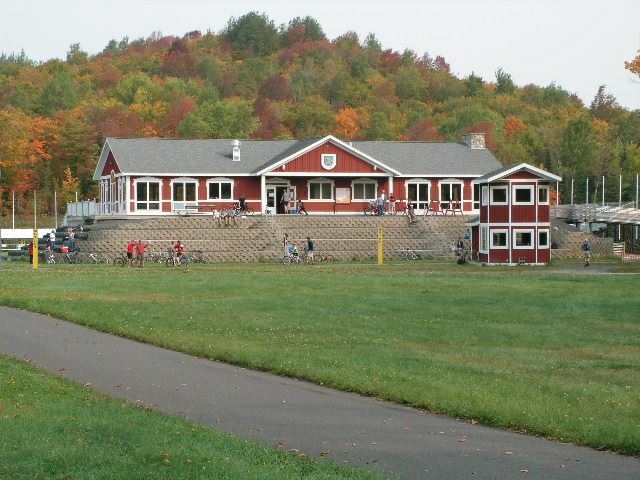 It takes a lot of hardworking volunteers to make the Nordic Heritage Center the best recreation center in the County. Join our volunteer Work Bee program and help us stay great! You can lend a hand cutting brush, clearing trails or doing other maintenance tasks. It’s a great way to get outdoors and have some fun. We can use your help for however long you can join us. Report to the Welcome Center and we’ll give you a job. If you’ve got tools, please bring them. Otherwise, we’ll provide them. We will gather, rain or shine. For more information, please contact Chad McPherson: trailetr@gmail.com. Like our Facebook page to hear when our next weekend Work Bee will happen. The concept for the Nordic Heritage Center came about in 1998 in a cooperative effort between the Libra Foundation and Maine Winter Sports Center. At the same time, Brian Hamel was working with the Loring Community Center and was working to find ways to persuade businesses to relocate to northern Maine. Their collective theory was to leverage the rich skiing history of the area as an asset and hopefully boost and stimulate the local economy. The Nordic Heritage Center and 10th Mountain Center in Fort Kent were built with this in mind, and in 2004 the first Biathlon World Cup was hosted in Fort Kent. It was a great success, and Aroostook County has hosted four more international biathlon events since 2004. 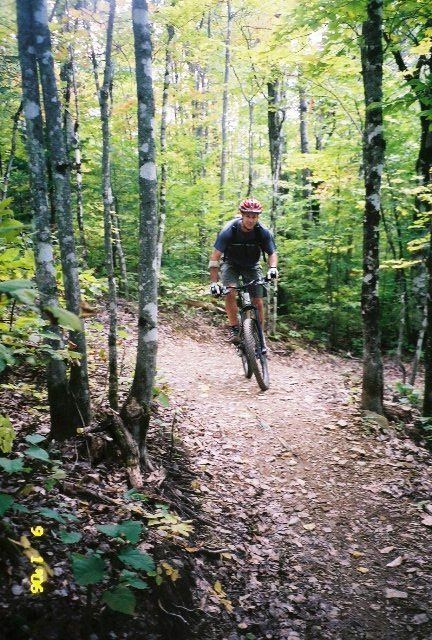 The International Mountain Bicycling Association helped by giving ideas and assisted in coming up with plans to create the first trails that are still used at the NHC. Later on, well known trail designer two-time Olympian Johnny Morton would help design the NHC’s biathlon trails. When the new facility was opened, Maine was the first ever to host the World Cup within two weeks in the U.S.A. The Nordic Heritage Center is open to everyone of every age. Come out and explore our 22 miles/35km of skiing, hiking, biking trails. Each trail is named for the people who helped create and bring to life that particular trail. We at the Nordic Heritage Center are looking to expand the growth of our membership base starting in the beginning of 2016. We’re expecting a surge of incoming members in just the first few months. 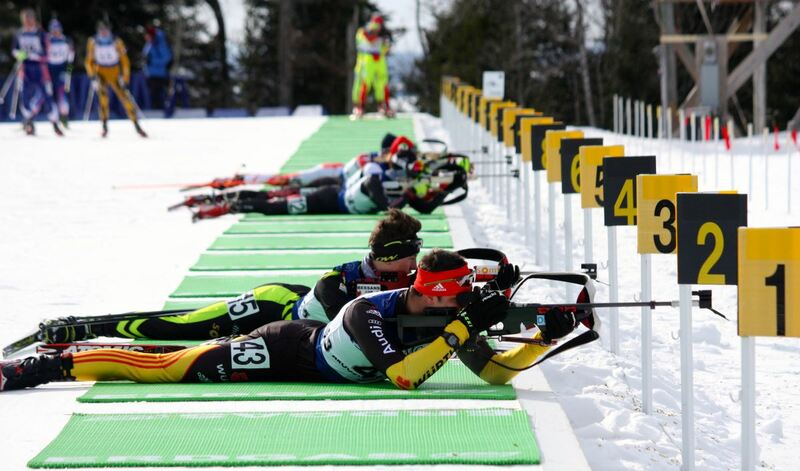 The World Cup Biathlon event in February is attracting people near and far to join. So we’re inviting sponsors to take advantage of this opportunity. Giving our members a discount at your establishment can really increase the number of people who use your business. 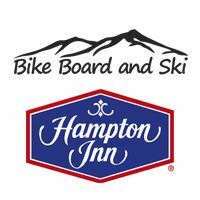 Bike Board and Ski along with the Hampton Inn have already joined our cause and are reaping the benefits that you, too, can enjoy. In return, we’ll advertise your name by putting your logo on our newsletter and website. This would benefit all parties involved. With our membership growing, this gives you the chance as a business owner to become a part of something worth putting your name on. A marketing partnership between our two businesses will help attain customer loyalty from our shared consumer community. We have a strong foundation already here at the Nordic Heritage Center, but we’re looking to build on it with your help. The Nordic Heritage Center in Presque Isle is an outdoor recreation facility found off the beaten path for a reason. If you were to picture experiencing the Maine outdoors’ rustic beauty, then the Nordic Heritage Center is the way life should be. Have you found that your outdoor equipment is stashed away in the corner? Well it’s time to break it out this year, so come join us. Perhaps you don’t have any equipment hidden away at home and you’re looking to get started. Well that’s OK, because we have rentals here too! There are also activities to become a part of that don’t require equipment. You could take a leisurely stroll and witness the NHC’s breathtaking views of northern Maine. Here at the Nordic Heritage Center, we’ll accommodate your needs year round by providing a facility that’s accessible, clean and welcoming. It’s a place to further your skills as a Nordic skier, to enjoy your bike off-road, to tackle this winter in snowshoes, or to hike with friends or family. But most important, the NHC is a place that benefits its members’ health and well-being. This facility is built to suit different levels of ability. There are currently more than 20 kilometers of trails for Nordic skiing, snowshoeing and mountain biking with various difficulty levels to tackle. Our vision is to create a community atmosphere here for families and friends and to promote new relationships. Joining with us as a member is the first step to becoming a part of this community. Our annual membership is $35 for an individual or $70 for a family starting in 2016: an incredible bargain for just pennies a day. Making this commitment to join us benefits everyone involved: it will help to protect the longevity of our trails and programs. The NHC offers clubs and programs to keep busy all seasons of the year. There are youth ski lessons every Saturday, women’s trail nights, mountain biking group rides, the Nordic Trail Festival and multiple ski competitions. As a member, you’ll receive a discount on use of our facilities and lodge for any group events you wish to plan in the future. Presque Isle’s local businesses Bike Board and Ski and the Hampton Inn are taking part in our community by offering discounts to the NHC members and additional businesses are more than welcome to join. Our mission in the end is to provide a fun, healthy, year-round, world-class venue for all ages and abilities to be a part of. We’ll provide the path for all to experience our facilities and trails. We hope to see you soon as a member of our community at the Nordic Heritage Center so that we can all tackle this adventure together through the great outdoors. Are you looking for a place to hold a get-together? What about a business meeting, a wedding? Or maybe you just want to have a family gathering or a birthday. It can be frustrating trying to rent a place and not being able to find a place that isn’t booked, especially in the popular months, such as summer or during the Christmas and holiday seasons. Well, we at the Nordic Heritage Center may be able to help. At the Nordic Heritage Center, we offer a beautiful view of the outdoors. With an open area and a lots of lawn space, we can provide a great place for large (or small) gatherings. We have a lodge that is equipped with restrooms on each level and a full kitchen equipped with a stove, sink, refrigerator and dishwasher. We even have WiFi! Our guests can enjoy the outdoors and have a place of shelter as well. Rental fee must be paid 10 days prior to the rental date, and it will be rented on a first-come, first-served basis. Prices will vary depending upon the number of guests in attendance. Alcohol must be acquired from a licensed vendor and must be removed from the premises when the event is over. There will be no tobacco permitted on site. A refundable security deposit must be paid at the time of the reservation. The rental fee must be paid one month prior to the reservation date. Again, prices will vary with the number of guests in attendance. Tents will be permitted. They will be recommended for 75-200 guests and required if the attendance will be greater than 200. Use of the lodge will be allowed in all cases. If you are planning to have a gathering of people, we truly hope that you will consider the Nordic Heritage Center. For more information on the rental policy, please visit info@nordicheritagecenter.org. We would love to have you!